The real story of the 12 brave American soldiers that were sent to the Middle East, immediately after September 11 to destroy the Taliban’s center, the city of Mazar-i-Sharif, is shown. Considering difficult climatic conditions, the abundance and insidiousness of enemies, their ruthlessness and fanaticism, as well as the lack of appropriate skills for the squad, the mission is considered almost impracticable. 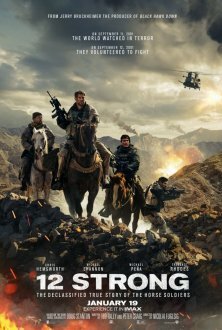 The authors of the movie “12 Strong” tried to make it neutral, for all the misunderstanding the peoples of the East are shown those who love their Motherland and are fighting for their people.